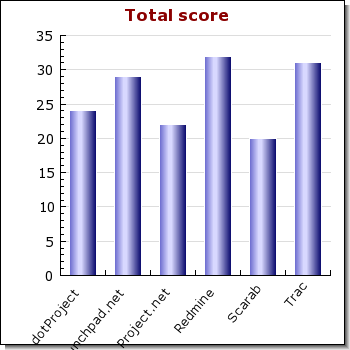 The table below summarizes the total score for all candidates, summing up all SOS Open Source scores (not weighted). For brevity here it is better to focus on a smaller list, for example by choosing the ones with the higher total rank, namely dotProject, Launchpad, Redmine and Trac. How do the finalist list of 4 perform against each other? 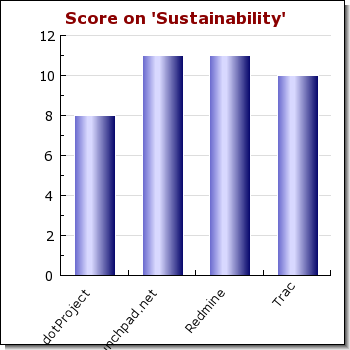 Let’s start by comparing them in terms of Sustainability. 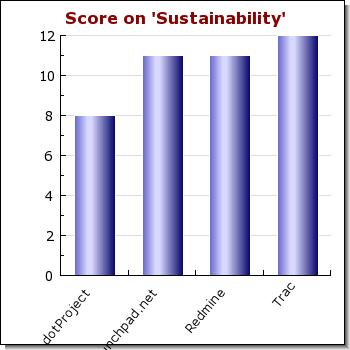 The Project Sustainability sums up Maturity (all are older than 3 years), Stability (all stable and maintained, dotProject showing a decreasing development activity, see Ohloh and Melquiades for references), Popularity (Launchpad and Trac are very popular, while dotProject and Redmine are gaining attention), Books availability (books are available for all of them but Launchpad; it must be said that Redmine’s book is written in Japanese though) and Community dimension and leadership (dotProject and Trac have small teams, Redmine slightly bigger and Launchpad has a very large development team; both dotProject and Redmine are community-led project, while Trac and Launchpad are company-led). 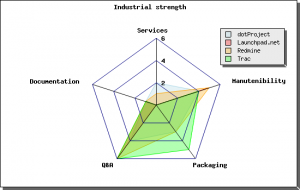 How do they compare in terms of Project Industrial Strength? The Project Industrial Strength considers Training and Commercial support (dotProject is the only one providing a sort of training service; community support is available both for dotProject and Redmine, while Launchpad commercial support is available on a subscription basis for hosted projects). 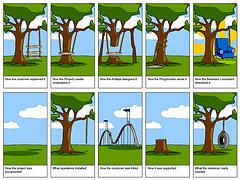 All selected projects make available Documentation, only in English. 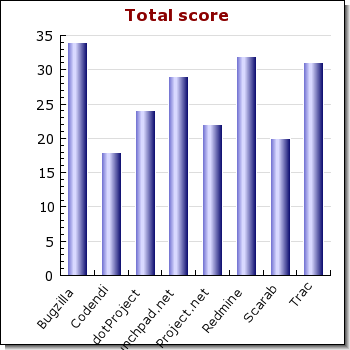 QA processes are supported by the active use of tools for all projects, but dotProject reacts slowly to bugs. The % of comments in the source code is over 20% for all, Trac and Launchpad are even around 25%. Project Strategy covers 4 different metrics related to the License (copyleft, corporate-like or permissive), the Roadmap, the code modifiability and the project’s sponsor. All projects are licensed with a copyleft license (GPL for all but Launchpad, licensed with AGPL v3). SOS Open Source gives higher marks to the most permissive licenses because copyleft licenses used within company-led open source projects tend to reduce external contributions, but this doesn’t apply to community-led projects. For all projects are available tools to propose modifications, but the process is unclear in the dotProject case. Last but not least all finalists publish a detailed roadmap, but dotProject. SOS Open Source methodology returning viable open source projects – that are solid, supported and achieve software evolvability in a systematic manner – makes faster to identify a short list of candidates. Testing features, security and performance is time-consuming and SOS Open Source helps to do it only for a very limited set of project. Perhaps Launchpad could be adapted to be an internal development system, but then, with enough hammering you can get a square peg into a round hole. 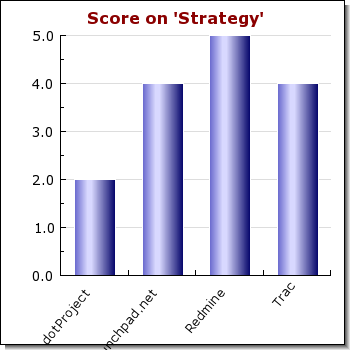 Trac can’t manage multiple projects yet, but is a good candidate to manage a single project. BitNami and Turnkey virtual appliance are available. Redmine manages multiple projects, with software configuration management support for many repositories (CVS, Bazaar, Darcs, Git, Mercurial and Subversion), LDAP authentication support, multilanguage support (Italian is not perfect, though), role based access control and a flexible workflow engine. Beyond all available features, Redmine has a rich plug-in directory, and more are available at github. Redmine Plug-in Tutorial is simple and effective. Redmine is a simple and easy extensible platform written using Ruby on Rails, whose design was influenced by Trac. 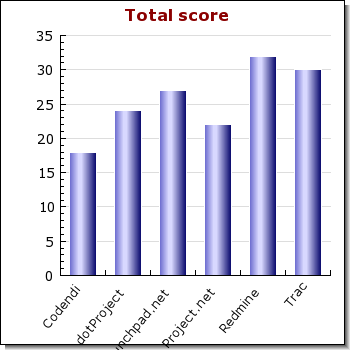 Overall, Redmine is worth our attention, and then we moved to the prototype stage. (BitNami and Turnkey virtual appliance are available too).